1846 Cover to Shaftesbury (stamp not tied) showing a fine DONHEAD-ST.-ANDREWS undated circle in Red on the front and a very fine SALISBURY/DE 29/1846/2 SKELETON datestamp on the reverse, WL 655. 1835 Entire addressed to Llandovery showing on the front a very fine FRAMED "PAID AT/MARLBOROUGH". SUPERB. 1836 Cover to London showing on the front, a very fine SALISBURY/PENNY POST and No 9 Receiver. Superb. 1850 Much-redirected cover from Marlborough and eventually to Chertsey. There are several manuscript endolrsements and varfious datestamps for Guildford, Reigate, Dorking, etc - full description attached with item. 1858 1d Pink envelope to Salisbury showing a fine SUTTON-BENGER (under Chippenham) undated circle. 1845 1d Pink envelope to Exeter showing a very fine LANDFORD (under Salisbury) undated circle and script-type straight line DOWNTON, WL 278. 1847 1d Pink envelope to Eton College, Windsor showing on the front a fair to fine DAMERHAM (under Salisbury) undated circle. 1816 Entire to Highworth, Wiltshire showing a superb SWINDON REVERSED HORSESHOE, WL 700. 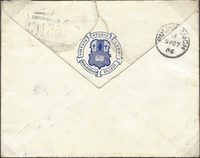 1860 Cover from Germany to Bradford, Wiltshire showing on the front a SUPERB 'MISSENT/TO/BRADFORD/YORKS' in dark blue, YK 527. Very Scarce. 1836 Entire to Bristol showing a fine DEVIZES/PENNY POST, WL 252, on the reverse. A framed 'No 4' Receiving House is on the front. 1849 Mourning envelope to Monmouth showing a very fine AVEBURY undated circle on the reverse. 1851 1d Pink envelope to Oxford with, on the reverse, a very fine BREAMORE, Salisbury, and ROCKBORNE undated circles.